Straw is the commonest substrate for Oyster Mushroom cultivation. Other agricultural wastes (e.g. corn stalks) can be used. Invasive plant species such as water hyacinth and kudzu are also possible substrates. Pasteurization of straw by heating: The tried and true method. Cut straw into 3-4 inch lengths. 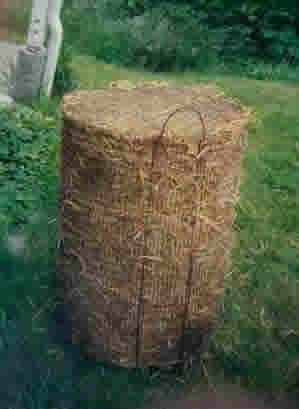 A shredder may be used, or if not available, weed-whacking straw in a garbage can do the job. 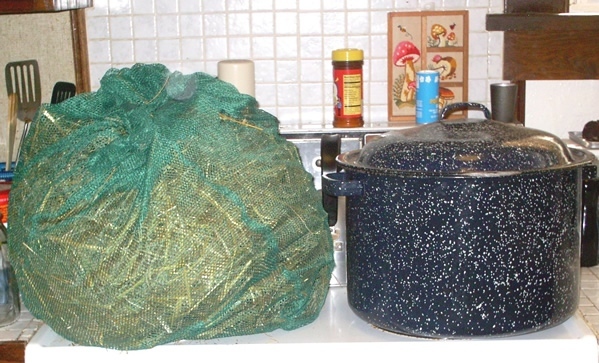 Indoors: Straw in pillow case, nylon mesh laundry bag or similar, submerged in water and heated 160-170 degrees F. for 1 hour (for indoors on stove top ). 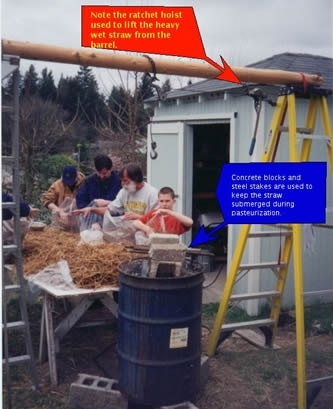 Outdoors: Use 55 gallon drum, wire mesh basket and butane burner for pasteurizing a whole bale of straw. See photos below. Inoculate with grain spawn on a clean smooth surface wiped down with 70% isopropyl alcohol. Fill a clean, 45 gallon drum with fresh water and add 4 cups of Calcium hydroxide (hydrated lime) or Calcium oxide (quicklime) with stirring. Completely immerse in the lime water solution for about 2-4 hours. Drain and immediately inoculate with spawn. Keep straw submerged in peroxide solution 24 hours. Drain and rinse with fresh clean water twice. After 2nd rinse and drain, immediately inoculate straw with spawn. Submerge bag of straw under water for 7-10 days. This allows fermentation by anaerobic organisms and eliminates other microorganisms. For a whole bale of straw keep submerged for 2 weeks. Drain well. The water will be quite stinky, so avoid contact with bare hands or clothes. Spread straw on clean surface and inoculate with spawn. Exposure of the wet straw to air destroys anaerobic organisms, resulting in straw that is "pasteurized" and ready for inoculation.